Image caption NHS could save money by reducing variation in treatment between areas. The NHS in England could save money by carrying out fewer less effective procedures, a report has concluded. The Audit Commission says cutting spending on treatments that work less well could save up to £500m a year. In a separate report, The King's Fund says there are still unjustified variations in treatment between areas. The government says it will work with experts to help identify which ineffective procedures the NHS should no longer fund. 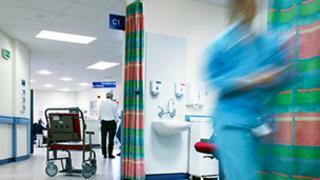 The health service in England has to find savings of £15bn to £20bn by 2015. This pressure to become more efficient has led to a growing scrutiny of differences between areas in the number and type of treatments they fund. Many Primary Care Trusts (PCTs) have drawn up lists which set out their spending priorities. Those treatments which are classed as a lower priority can either have funding withdrawn or restricted to patients with a greater need. The Audit Commission looked in detail at the work done by a small number of PCTs and estimated that reducing spending on lower priority treatments could save up to £500m. Andy McKeon, from the Audit Commission, said: "We were surprised at the variety of lists used. PCTs across the country are currently paying for treatments that cost the taxpayer money, and according to clinical experts have little or no real value to patients." But he admitted the £500m figure was a rough estimate, and not based on any detailed work on the value of individual treatments. Attempts to limit access to some, such as hip and knee replacements, have already proved controversial. Their report suggests there is little consensus on how to set priorities and says a national list of treatments of low clinical value might help. But the government has firmly rejected the idea of national lists of banned or restricted treatments. Officials said blanket bans risked ignoring the needs of individual patients. Health minister Anne Milton said: "We would not recommend creating definitive lists of ineffective or inefficient procedures without a clear consensus from those who are experts in the field." The King's Fund says its research, also published today, reveals a pattern of persistent variation in the treatment patients receive. Surgery rates for cataract replacement varied by 300% between some PCTs. Academics say that suggests patients in some areas are not being given operations they need, while in others some are having treatment that does not improve their health. Professor John Appleby, chief economist at the King's Fund, said: "This is unfair to patients and inefficient for the NHS. "Remedying this is urgent given the need to improve quality of care while the NHS grapples with the biggest financial challenge in its history". The think tank welcomed work already done by the Department of Health which earlier this year published an atlas of healthcare, which mapped variations in procedures as diverse as diabetic amputations and hip replacements. The difficulty for NHS managers and clinicians making decisions is that simply knowing the degree of variation does not tell them what is the right level of treatment to fund. David Stout, from the NHS Confederation's PCT Network, said: "There are many different reasons why variations come about and we must remember that not all variation is bad." While economists see reducing variation as one way of the health service becoming more efficient, they also accept that they are also incredibly difficult to iron out.